Selling or giving away your computer? For your convenience 4 Click Secure Wipe has an option to automatically keep your computer's manufacturer recovery area, providing your computer has such an area and it is instact. If you click "keep it/sell it/donate it" & "keep recovery area" options at the download page then before wiping a new button will appear that allows you to inspect the area automatically chosen. 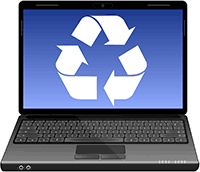 After wiping has completed you can follow the computer manufacturer's procedure for returning it to factory settings, known as "Recovery", that is restoring Windows and everything else that your computer came with when you first bought it, making it ready for re-use. None of your data, programs, etc will be there anymore. The computer will be faster than before and clean with no viruses or Windows problems. If you just want to dispose of your computer, or already have recovery CDs you do not need recovery. 4 Click Secure Wipe does not do the actual recovery, it just can preserve the special recovery area. After wiping, follow your computer's manufacturer's instructions for recovery. They are usually quite simple, something like pressing Ctrl and F11 together when starting the computer. Some computers do not have recovery areas. 4 Click Secure Wipe will tell you that before actually wiping. If the recovery area is damaged, missing or non-standard, it will not be preserved automatically. Thank you. The program was very quick and simple to use, unlike others that I tried and spent hours burning a CD only to have it not even launch.